The U.S. government is cracking down on a major Chinese telecom equipment maker over an alleged scheme to dodge sanctions on Iran. The plan by ZTE (ZTCOF) involved setting up several shell companies "to illicitly re-export controlled items to Iran in violation of U.S. export control laws," according to a U.S. Commerce Department notice to be published Tuesday. In response, the U.S. is imposing restrictions that will make it harder for ZTE to acquire U.S. components. Starting Tuesday, ZTE suppliers will be required to apply for an export license before shipping American-made equipment to the company. Three other companies affiliated with ZTE and linked to the alleged scheme, are also affected by the export curbs. Shares of ZTE, one of the world's largest telecom equipment makers, were suspended Monday in Hong Kong and Shenzhen pending an announcement on the restrictions. Before the trading halt, ZTE's stock had tumbled nearly 20% in both markets so far this year. The company, which hasn't specified when shares will begin trading again, says it's cooperating with U.S. authorities. "ZTE is fully committed to compliance with the laws and regulations in the jurisdictions in which it operates," it said in a statement. "The company is working expeditiously towards resolution of this issue." Nomura analysts said the restrictions won't affect sales of ZTE smartphones in the U.S. or immediately impact overall production because the company had already finished buying the U.S. components it needs for 2016. But ZTE could experience disruptions to its supply chain if the curbs stay in place for long enough, as finding alternative suppliers for some parts would most likely be difficult, the analysts said. 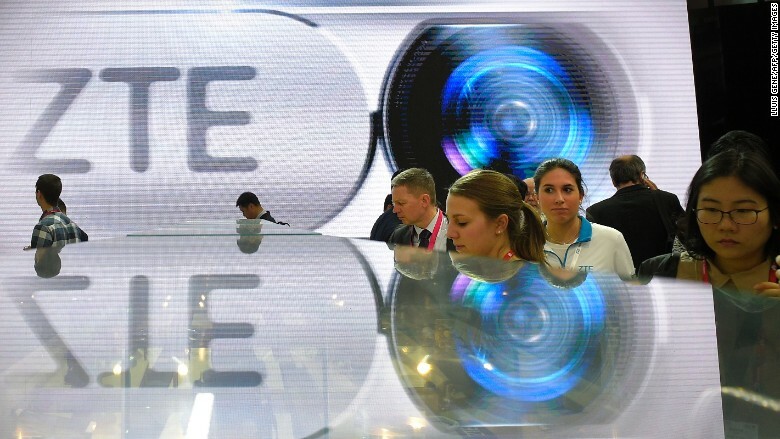 After reports of the U.S. government's move against ZTE emerged over the weekend, Beijing called for a halt to the restrictions. "We hope the U.S. side can stop the wrong decision to prevent harming our trade cooperation and the bilateral relations," Foreign Ministry spokesman Hong Lei said Monday at a news briefing.